My buddies Brittany and Terrence Roche, the Plant Power Couple, are Philly vegan superstars. They’re married bloggers, inventive recipe creators and the founders of an ever-growing Facebook group, “Plant Power People w/the Roches,” a friendly forum for new and seasoned vegans. They took the coveted “People’s Choice” title at the first ever Philly MAC-Down, a local vegan mac and cheese contest, and won “Most Original” at the 2017 Super Philly Chili Bowl with Terrence’s 3 Bean 5 Alarm TVP Chili. They’ve hooked nearly the entire vegan community on their now-famous coconut bacon salt, which debuted at the MAC-Down and is available for purchase at local vegan pop-up markets and through their online spice shop. So when an award-winning vegan duo like PPC releases an e-cookbook that includes a bunch of their newest recipes, you know you need to get your eyes (and taste buds) on it immediately! Their e-cookbook, 20+ Recipes to Become a Cruelty-Free Kitchen Badass, can be purchased on their website and features recipes like Bac’n Mac and Beer Cheese, Jackfruit Carnitas with Avocado Lime Sauce and Rum Cupcakes (are you drooling yet?). Their recipes are totally plant-based, and many are gluten-free or can be made that way. 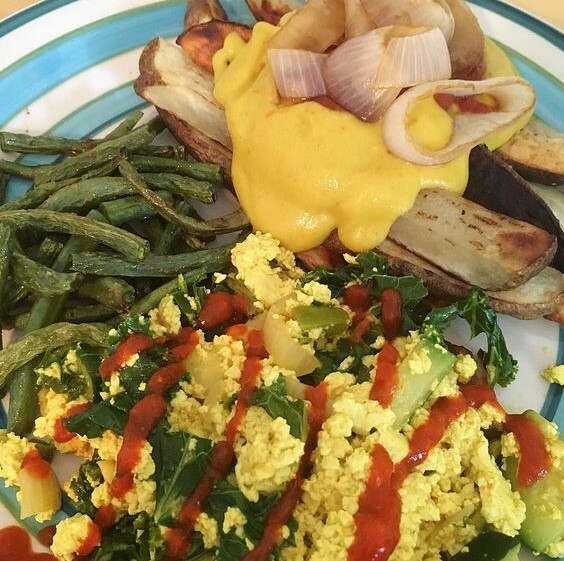 I made the Red Lentil Cheez Fries (topped with smoky onions) as a side to tofu scramble. Amazing brunch! “Why didn’t I think of this?” That was my first thought when I saw they’re using red lentils as the main ingredient in a vegan cheese sauce. Brilliant! If you’ve cooked with red lentils before, you’ll know they cook down (like a split pea), leaving behind a thick, smooth and creamy base that can be used in anything from a soup or chowder to a pasta sauce. Using red lentils to create a vegan cheese sauce is pure genius, and making and tasting this recipe only confirmed this. It’s seasoned with garlic powder, turmeric, cumin and other delicious spices and flavors. Wow. A couple things: While the sauce is incredible on roasted potato wedges, I’m sure it would be equally as delicious on rice, quinoa, pasta and roasted or steamed veggies. Or just on a spoon. Also, this sauce has inspired me to throw red lentils into every creamy, cheesy sauce I make for added thickness and extra protein. Thanks, PPC! 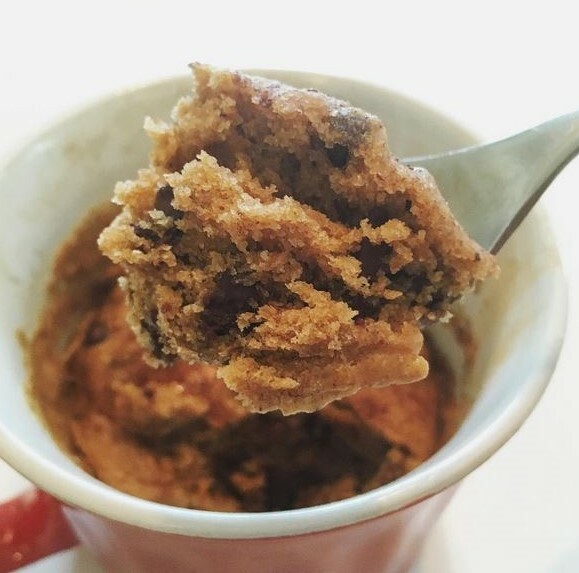 Warm, gooey mug cake satisfies any sweet tooth. Sometimes you need something sweet, like, now. You don’t want to take the time to bake (and, let’s be real, eat) a whole bunch of cookies or cupcakes but you don’t have anything sweet in the house you can quickly grab. This is where a microwaved mug cake comes in. Surprisingly, I’ve never really tried to make a mug cake. If I’m being honest, I’ve always been turned off at the thought. Will it come out under-cooked, or overcooked and dry? Will it even taste like a cake? Can you seriously “bake” something in the microwave? However, I trust my friends and knew they wouldn’t steer me wrong, so I decided to try their version one night in the midst of a serious sweets craving. With only a handful of ingredients and a super fast cook time, PPC’s Peanut Butter Snickerdoodle Mug Cake came together in just a few minutes. It was perfectly gooey and not overly sweet but enough to satisfy. I would for sure make this again any time my sweet tooth strikes. A couple things: The recipe calls for ingredients like whole wheat flour, raw sugar and coconut oil so you don’t feel like you’re being totally unhealthy, which I love. Guilt-free sweets are my favorite kind. Also, because I’m a rule-breaker and a total chocoholic, I threw in some Enjoy Life vegan chocolate chips. Let’s be honest, chocolate makes everything better (and is something really a dessert without chocolate? ), so if you’re trying this recipe it’s a variation I highly recommend. As if just buying their e-cookbook and trying their incredible recipes wasn’t enough, they’re rewarding you for sharing your PPC-inspired creations! Plant Power Couple Brittany and Terrance Roche are amateur athletes and travel junkies whose number one passion is creating vibrant, delicious food made from plants and sharing that food with those they love. Follow Brittany and Terrence on their blog, Facebook and Instagram for all things PPC.